El Coyote. The name alone conjures up news articles of human trafficking and images of starving day laborers suffocating to death in the back of a box truck somewhere in the Texas desert. So already, the remake of Sgt. Garcia's was not off to a good start. Seth was in town for the day and was craving Mexican food. "Well," I told him, "here are the options. Either we can go to Five Burros, which ain't bad, but we'll be waiting for half an hour to it down if we're lucky, or we can try this spot that I've yet to go to. It's a new-ish Mexican joint in what used to be an older Mexican joint." He pondered the wait against the uncertainty. "How was the older Mexican joint?" he asked. "It wasn't too bad. 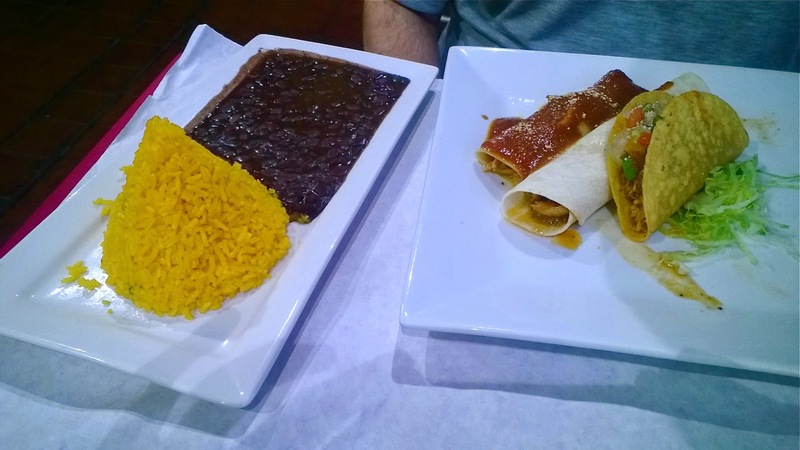 Reasonably priced, huge portions, pretty good food." And that was it. Within minutes, we were out the door and walking along Austin Street, soon to climb the stairs to the second floor of that building with the clock tower that no one has ever used to tell time. It used to be that you could make Open Table reservations at Garcia's. 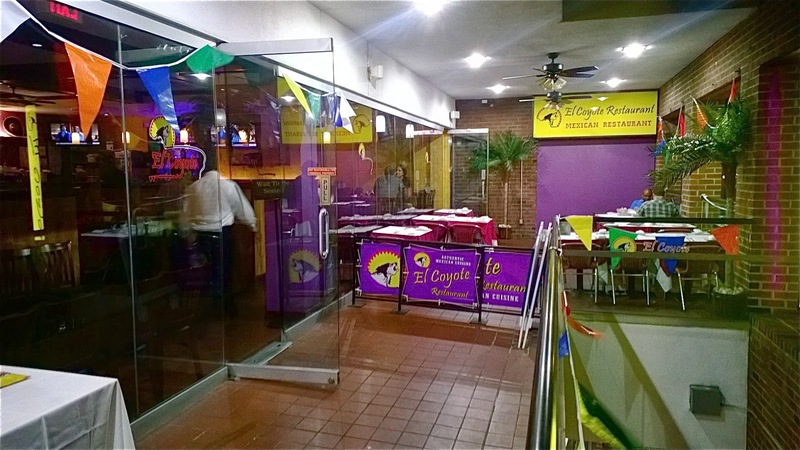 El Coyote nixed that luxury, but it was far from crowded. About a half dozen tables were occupied on this midweek early evening and about half the seats at the bar were taken. It was the perfect temperature to eat outside, so we chose to go that route. There was a bit of wind, but that's Mother Nature's fault, not El Coyote's. Everything else was El Coyote's fault. Our waitress, who was probably ten years old (Seth, ever the optimist, guessed twelve), spoke virtually no English. The busboy, on the other hand, spoke perfect English. "This seems like a severe HR error," Seth said after our waitress took our order with what might have been the most lost, confused look ever to cross the face of a Oaxacan smuglee. After a failed but valiant attempt at asking what beers, if any, the restaurant had on tap, Seth ordered a bottle of Dos Equis (I stuck with water). He was presented with a room temperature bottle. One could make the argument that El Coyote wanted to be authentic and that many restaurants in the poorer sections of Mexico can't afford refrigerators for their beer. Whatever the reason, Seth waved over our waitress to ask for a chilled glass. "Ice cubes?" she offered. Chips and salsa, the standard thing to nosh on while waiting for one's food at any Mexican restaurant, was the first food we tried from the kitchen and, while the chips were fine, the salsa was virtually tasteless and was mostly just salsa water. 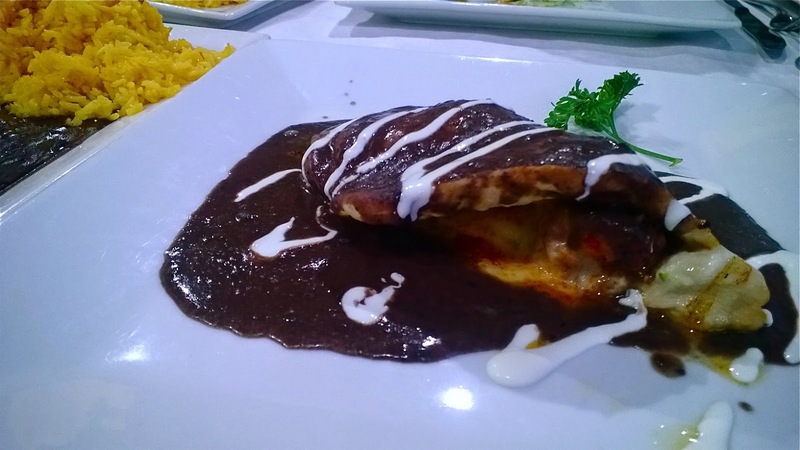 Eventually, I ordered the Pollo Relleno, a piece of grilled chicken wrapped around a Mexican sausage under a black bean sauce, and the Sopa de Tortilla, a chicken and avocado soup in a chili pepper broth with lime, cheese, and cilantro. The chicken entree I ordered could have, potentially, been very good, except that the chicken breast I was given either spent six hours tanning itself into a cancer ward under a heat lamp or was beaten to mercilessly with a mallet wielded by an obese psychopath. There was no moisture to the meat whatsoever. Wrapping one piece of meat around another is an idea that is quite dear to me and, to this day, I will defend KFC's fried chicken of doom sandwich, the Double Down. This, however, was no Double Down. The black bean sauce was fine, but it was just the same sauce from the rice and beans that each dish gets served with, so I had this lazy feeling about the whole thing. Plus, seventeen bucks? Really? Seth meanwhile went for the Combo Mexicano. One hard taco, one enchilada, and one burrito. Good move, buddy. Hit three entrees at once. The taco won for best in show. He liked the flavor of the shredded chicken and the tomatoey sauce it came in. He wished that there was a little more filling, something beyond chicken and onion, but at the same time he admitted that the bar, by this point, was extraordinarily low. His burrito was pitifully small, and while he was none too thrilled at its Micro-Machine stature, I was willing to chalk that up to the fact that it was just part two of a combo meal. 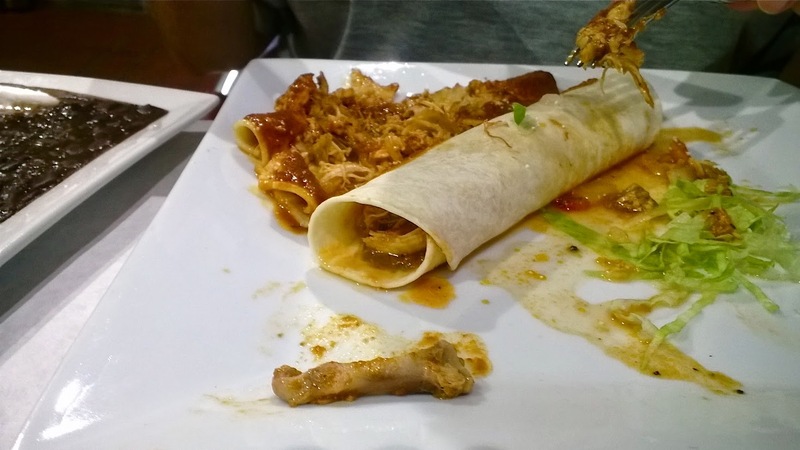 What couldn't be forgiven was the enchilada, which, upon biting into it revealed not one, but two full chicken bones hidden within. Oh wait! I forgot about the soup. But then again, so did they. The soup arrived halfway through the entrees and I can understand why they forgot about it. It was totally forgettable. For starters, although there was admittedly some chicken and avocado floating around in there, it was mostly broth, and the broth (a chili-pepper one) was about as bland and tasteless as having no broth at all. The menu said that there was lime and cheese, but I was hard pressed to notice. This was a truly bad soup. ...the rice and beans were good. 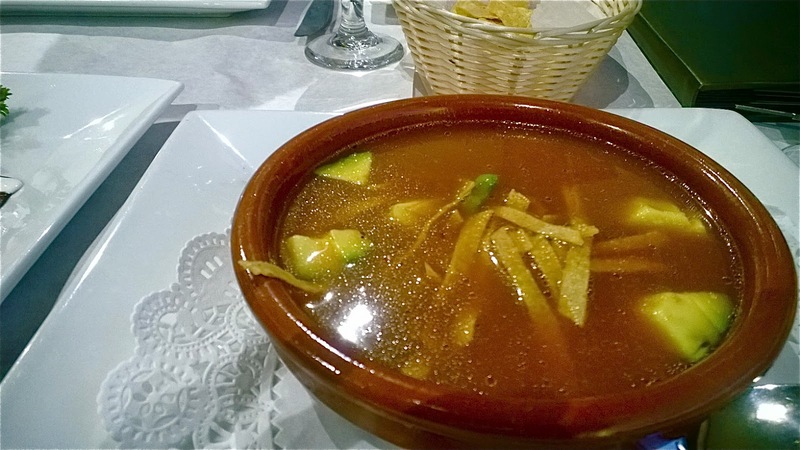 A warm beer, a soup, an entree, a chicken taco combo, plus tax and tip clocked in at $53.